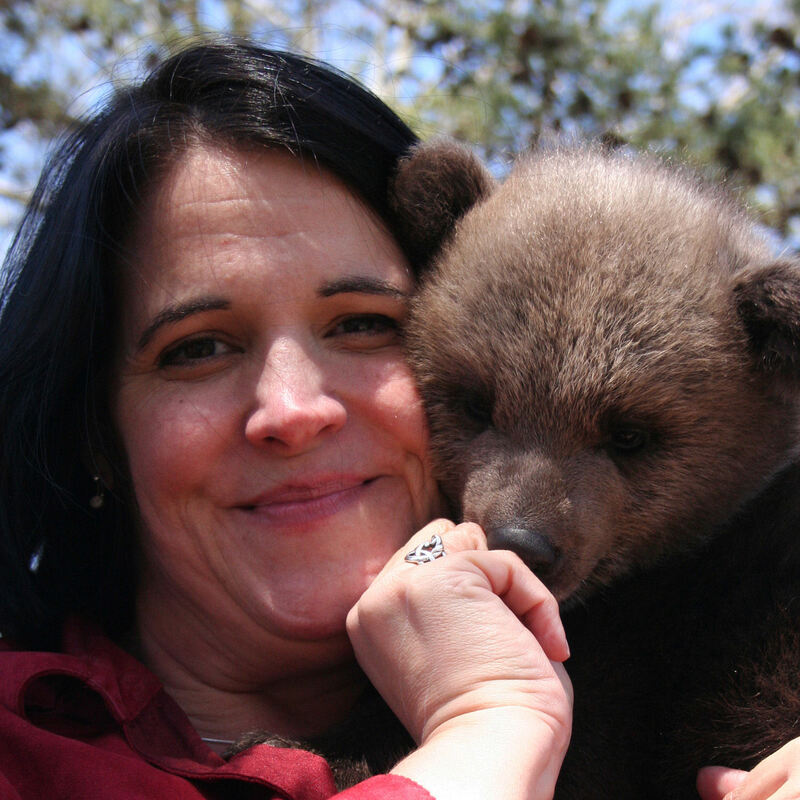 Kim Atchley with Siriana “Siri” Nyeff, an extremely rare Syrian brown bear cub. The cub was three months old when this photo was taken. In a paragraph, tell me a little about you. Personally, I’m 45, a wife and mom of 3 with my kids 23, 16, and 11. Life is NEVER dull on the home front. Professionally I consider myself as having a non-traditional career path. I taught middle school science and ‘came home’ after our second child was born, picking up my passion for writing and starting to freelance. I became a stringer, covering the arts for our local paper. The journey into caregiving for my parents led me to write many articles on the topic and co-author When Your Aging Parent Needs Care. After my parents passed, I slowly picked up more freelance work again. I also became a speaker and blogger for senior and caregiver advocacy issues. I’d never in my wildest imaginings saw myself as a speaker, but it has become a very natural progression of following where God led me. Still freelancing, I picked up a contract with Hollywild Animal Park that has led to a position with them as Director of Marketing and Public Relations. Never be afraid to try something new and learn a new skill. I love what MWSC member Charlotte Babb once told me – that with technology you’re never more than four months behind (because it changes that fast) so don’t feel bad about where you are. Technology can be daunting, but if it looks interesting, just jump in! If you could live anywhere, where would it be? In April I learned that the home of my heart is where my family is, but the home of my soul is on the Dingle Peninsula in Ireland. So I’d have to say Ireland, but only if I could bring my family! What book are you reading? I’m re-reading the Outlander series on audiobook as I drive to work. I learned to kayak on the ocean when I was just about to turn 40. Nugget learned: to start kayaking, do so in much calmer water! Reward for stepping out: After drifting away from the group and willing myself not to panic, a big sea turtle came up right beside me offering great encouragement – #memorablemoment! MWSC and NFPW have provided an incredible professional network for me, one that I feel is truly unique in today’s networking culture. Both organizations transcend the “who can do what for whom” networking model. Through NFPW I’ve definitely found a group of professionals who want to make a difference in the lives of others in any way they can. That really resonates with the way I’ve approached every aspect of my own professional and personal life. Both organizations have created an environment where I can find support (professionally and personally) in an instant which is an incredible gift. Whether helping me learn new technologies in a seminar, sharing personal/professional challenges over lunch, brainstorming ways to make a stronger impact on a special project, or even being a last minute on-call tech support when I’m pulling my hair out, I have a network of true professional friends that stretches across the country. This entry was posted on November 12, 2013 at 3:08 AM and is filed under Uncategorized. You can subscribe via RSS 2.0 feed to this post's comments. Kim is truly a wonderful and beautiful person. She has been a real blessing in my life. You go girl, you just keep right on moving forward and enjoying what life has to offer. So happy for you! I just looked at some of the photos of Hollywild. Wondered if NFPW members will get to see and pet some of those loveable creatures if we get to the South Carolina conference. That would be a draw for animal lovers. Nice presentation, Terry and Kim.